In March 2015, Jose Molina came to Immigrant Defense Project (IDP) for help fighting his deportation. With Jose, IDP pulled together a team of talented advocates to pursue a creative legal defense strategy and mobilized his community to express their support. Over the course of 4 years, Jose Molina endured being arrested and jailed arbitrarily by Immigration and Customs Enforcement (ICE) two times. He and his family also lived with the anxiety and uncertainty of removal proceedings. Nonetheless, they kept fighting to stay together. 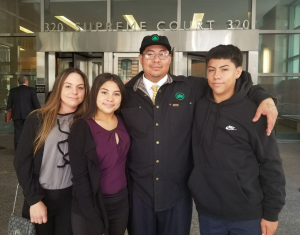 In September 2017, after a significant push by supporters, Jose was granted post-conviction relief, released from detention, and is no longer facing deportation. Jose is now back home! Watch this video and read on for more about Jose’s journey! Jose’s childhood was far removed from the American dream. He grew up surrounded by violence in his Brooklyn neighborhood. He was mugged several times by young men in the street during the 1990s, and at 14 was slashed in the face by a classmate, requiring 30 stitches. Unfortunately, his home was no safe haven, as he had endured years of physical and verbal abuse by his mother and stepfather. Soon after the slashing, a hopeless Jose left high school and home, and faced life without an education or a family to support him. In order to cope with constantly feeling unsafe, at age 14, Jose began drinking. At age 18, while under the influence of alcohol and after years of being bullied, he got into an altercation after being aggressively confronted in the street by young man known locally for being armed. He was convicted of felony assault and served two and a half years in prison. After his release, Jose continued to struggle with addiction and as a result, ended up with a few more convictions. In 2007, after attending alcohol rehabilitation, Jose got a job at the NYC Parks Department, where he has worked ever since. He is highly regarded by his supervisors for his dedication, professionalism, and reliability. Jose is immensely proud of his job, his DC-37 union membership, and his recent civil service title, which makes him a permanent employee of the Department. He has been so successful in his work at Van Cortlandt Park that he has been repeatedly promoted and given responsibilities reserved for a small number of trusted individuals. Jose has raised two intelligent, strong, and kind children who are completely devoted to him. His daughter, an honors student at her charter school and vice president of the student council clearly states the importance of her father in her life. Around 5:30 AM on January 30, 2013, officers from the federal Immigration and Customs Enforcement (ICE) agency pounded on the door of the family’s apartment. Thinking they were local police, Jose’s wife opened the door and five officers pushed past her into their home. As officers surrounded Jose and his wife in the living room, another blocked the children, screaming and crying, in their rooms, and prevented their parents from comforting them. Jose’s wife begged them to tell her why they were there. It was not until they handcuffed Jose in front of the family that they told her they were immigration agents sent to detain and deport Jose for two convictions from years ago. Jose spent the next two months in immigration detention. His children, without their father, cried themselves to sleep every night. Their mother began to suffer panic attacks. Jose was released from detention after his case was terminated favorably by a judge, but the government appealed, and Jose and his family lived with the daily fear that he might be re-detained at any moment. This nightmare came true when ICE arbitrarily locked him up at a routine check-in. Jose’s supporters sprung to action, making calls and writing letters of support for a motion to vacate the decades-old conviction that subjected Jose to mandatory deportation. On September 11th, 2017, the DA’s office agreed not to oppose Jose‘s motion; a judge vacated the old conviction and adjudicated Jose a “youthful offender.” ICE released him and terminated immigration proceedings, as they now have no legal basis to even threaten Jose with deportation. Jose‘s case is a reminder of our collective power to help one another through crisis and the possibilities that local advocacy holds for stopping deportations.